New: MDaemon 14 – The Exchange alternative is now even better! Microsoft’s decision last year to call time on Small Business Server has created a noticeable boost in demand for ‘on-premise’ email server software that will play nicely with Server 2012. Small businesses unwilling or unable to follow the Microsoft route of moving everything to the cloud have been left looking for alternative suitors to Exchange that can offer the same experience for their Outlook, Web and mobile device users. 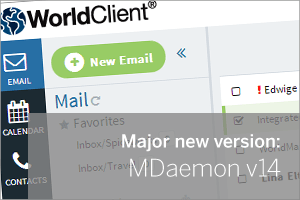 A new default theme (called ‘WorldClient’) for MDaemon’s webmail client has been introduced in response to customer requests for a more modern, cleaner browser-based email client. This new theme incorporates numerous design elements from popular consumer and business browser-based email clients and was designed with input from professional UI/UX development teams. This new WorldClient theme is now the default theme for new installs. When updating, the installer will ask if you want to switch your users to this new theme. 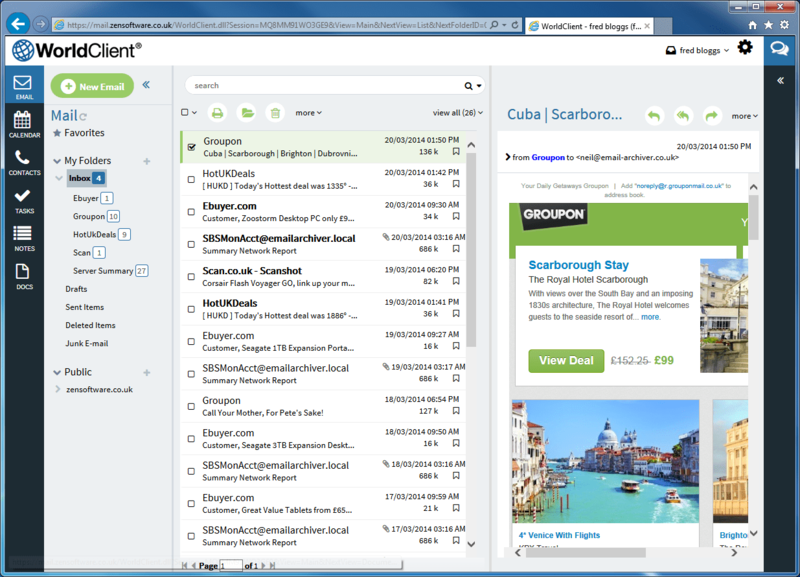 Additionally, the WorldClient and LookOut themes now offer a side by side calendar view. MDaemon’s ActiveSync server now supports accessing other users’ shared folders in addition to personal and public folders. Please bear in mind that the exact behaviour of ActiveSync clients accessing shared folders can vary from client to client. Inline images are now supported in HTML messages composed in WorldClient as well in signatures. Inline images can be added via WorldClient, WebAdmin or the “Append a corporate signature” action in the Content Filter engine. WebAdmin now allows Global Administrators to administer WorldClient’s service settings, freeze/unfreeze mail queues, configure server-wide auto-responder settings and queue management functionality for Global Administrators. In case you’re running a version of MDaemon prior to 13.6, here is a brief summary of new features introduced since MDaemon 13, all of which are incorporated in MDaemon 14. Enhanced statistics reports in WebAdmin. Support for accessing public folders for ActiveSync clients. Support for the latest ActiveSync protocols allowing support of Outlook 2013 as an ActiveSync client. Enhancements to the ActiveSync policy editor allowing control of many new policy elements. Improvements to MDaemon’s attachment stripping and linking feature. Improved Domain Manager and Public Folder management screens. Improved Grouping and Account template management. Optional (and customisable) colour coded session logs. Performance counters have been implemented to allow monitoring software such as Windows Perfmon to track MDaemon’s status in real time. Support for basic ActiveSync policies. Account hijacking detection and automatic blocking. Support for ActiveSync auto-discovery allowing users to quickly and easily connect their ActiveSync enabled smartphones to their MDaemon accounts.